So this is it, the 54th and final book in the Horus Heresy series. But before you despair, it isn't the end of the story and the mad Titan Horus is only just knocking on the doors of Terra. The final battle will be played out over a series of novels called the Siege of Terra, presumably ending with the legendary fight of Horus against the Emperor. That series starts with The Solar War, coming out in May this year. Black Library have promised that this series won't be drawn out into another 54 books before we witness the fight we are all waiting to see. It has to be said just what an achievement Games Workshop and Black Library have made. I never would have believed that the Horus Heresy would reach fifty four books over twelve years; that's four and a half books a year. To have such a grand vision eclipses even the ambitions of Marvel. They have recruited the ideal authors also, people who have lived and breathed Warhammer 40k. Dan Abnett, Graham McNeill, Ben Counter, Gav Thorpe, Guy Haley, Nick Kyme, James Swallow, David Annandale, John French, Aaron Dembski-Bowden, Chris Wraight, Christian Dunn, Mike Lee and Mitchel Scanlon. All have given much to create what is without a doubt one of the biggest and most impressive series in science fiction. Anyway, back to this last book and the story takes part in two main arcs. The first is the preparation on Terra to brace themselves against the coming darkness, complete with a plot to create sedition and anarchy ahead of the Warmasters arrival. This includes the infamous hero-exile and ex-Death Guard captain Nathaniel Garro and the enigmatic figure of Malcador (First Lord of Terra and Grand Master of Assassins) along with the other Knights-errant - including Garviel Loken who has been part of the journey since book 1, Horus Rising. Then there is of course the journey into chaos of the Death Guard and it's Primarch Mortarion, as they slowly succumb to a strange disease while lost in the warp. I'm glad that the series is being rounded off by James Swallow, he's been writing about the Death Guard since the fourth book in the series, Flight of the Einstein, back in 2007 and it's been interesting to see him grow as a writer in the time since. I can't think of a more apt author to describe the continued journey of Garro and the infamous one of Mortarion. I loved this juxtaposition of hero and villain, from the grim tale of the Death Guard Primarch and his legion, to the valiant efforts of the knight-errant and the preparations against the coming evil. The novel provides a good exploration of Mortarion's character, including flashbacks to his past, and his somewhat fractious relationship with Death Guard captain Callas Typhon who has re-united his troops as they prepare for the final invasion. The story on Terra is just as intriguing as small pockets of Chaos manage to break through the psychic defences and traitors try to undo the Loyalists efforts. The most astonishing thing about this book is that it's a tightly woven and fast paced story that stands out not just as a suitable finale to such an incredible series, but as a rewarding story in it's own right. You could read this book and enjoy it even without the vast weight of the series behind it. It is that good. There is so much going on, from the subtle signs of faith that will result in the worship of the Emperor as a god, to the fates of some of the Knights-errants and hints of Malcador's plans. 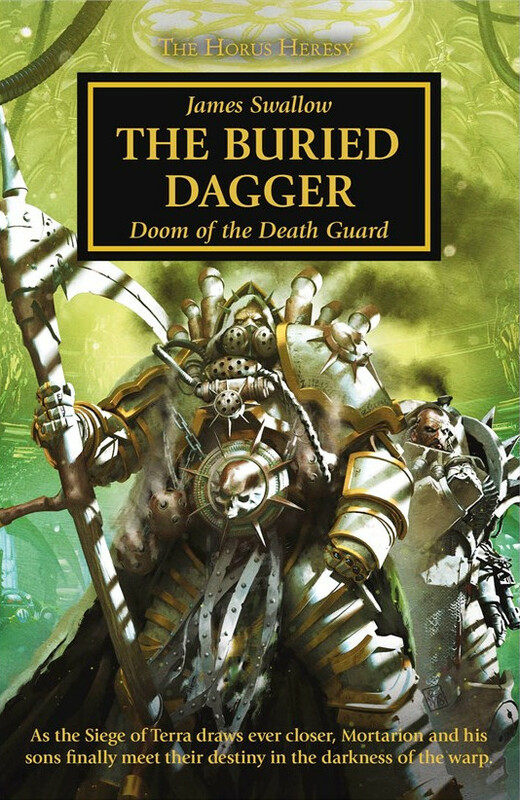 The Buried Dagger is a triumph from beginning to end, it's got bags of action, a seriously impressive story and a great cast of characters, essential reading for any Warhammer 40k fans and an entertaining read for those who aren't. Written on 25th March 2019 by Ant.